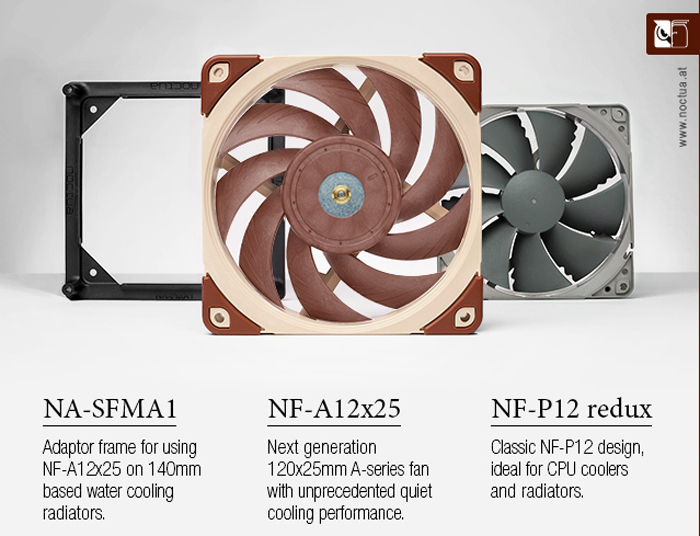 Noctua has released its long awaited next generation NF-A12x25 120x25mm fans. We saw samples of this fan back at Computex last June. Noctua has some amazing claims for the performance of this fan and a lot of the qualities on offer come down to the use of a patented new material dubbed Sterrox. In brief, due to the rigidity of Sterrox liquid-crystal polymer (LCP), it can be used to make fans with a very small tip clearance, so it can match or even beat two of Noctua’s regular NF-F12 fans in cooling performance. With its record tight tip clearance, the Noctua NF-A12x25 120mm fans work more efficiently by reducing leak flows. Sterrox features extreme tensile strength, an exceptionally low thermal expansion coefficient and excellent dimensional stability to facilitate this design feature – but it also of course requires high accuracy in manufacturing. 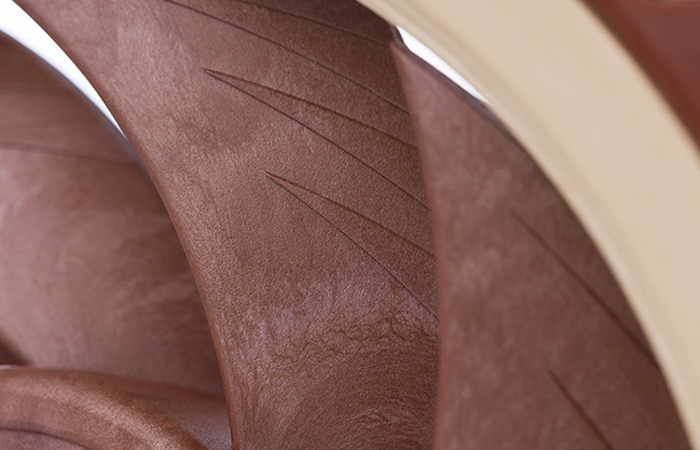 It isn’t only the material which helps the new fan series become Noctua’s flagship offering. The firm’s latest and greatest design technologies are implemented too. Thus the NF-A12x25 is designed with AAO (Advanced Acoustic Optimisation) frame and Flow Acceleration Channels. For smooth running Noctua’s reference-class SSO2 bearing is employed to create a well rounded premium product. The NF-A12x25 will be available in a 4-pin PWM version for automatic speed control, 3-pin FLX version with Low-Noise Adaptors for three different speed settings as well as a near-silent 3-pin ULN (Ultra-Low-Noise) version. Noctua says that its new NF-A12x25 120mm fans are available immediately via Amazon in the North America and Europe. Suggested pricing is as follows: NF-A12x25 (all versions): EUR 29.90 / USD 29.90. NF-P12 redux (all versions): EUR 13.90 / USD 13.90. NA-SFMA1: EUR 11.90 / USD 11.90. EKWB Vector Radeon VII water block launched Deepcool shares info about its patented anti-leak technology Noctua intros NT-H2 thermal compound Day 14: Win one of three Noctua cooling bundles QOTW: Who makes the best CPU coolers? From time to time, I have come across cases where the mounting holes haven't been perfect which has resulted in a slight deformation of the casing. In some cases causing some issues with the fans being used. I do wonder if the uber-tight tolerances in play here could be affected by less-than-uber-tight tolerances in the places they're mounted? I've had similar problems and have found that using the rubber fan fittings provided, instead of screws, worked a treat. That 140mm adaptor frame looks like a cludge, I wonder how long it'll be until they can start producing a 140mm version? Cue loads of comments about the beige…. I'm not overly bothered about how pretty my PC is, but I still cant handle things being that mismatched and wouldnt buy a Noctua because of it.